: Strongly built. 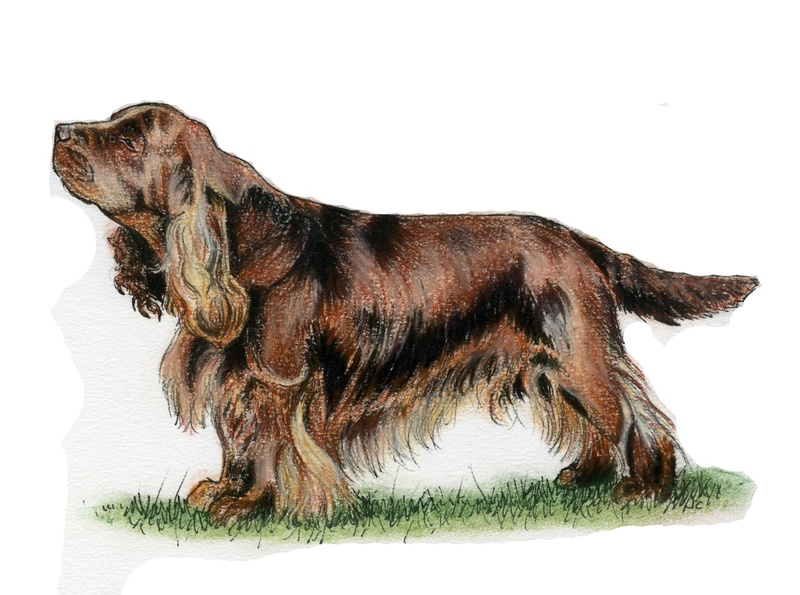 Active, energetic dog, whose characteristic movement is a decided roll, and unlike that of any other Spaniel. : Natural working ability, gives tongue at work in thick cover. Kindly disposition. : Wide, showing moderate curve from ear to ear, neither flat nor apple headed, with centre indentation. Brows frowning; occiput decided, but not pointed. : Nostrils well developed and liver in colour. : Hazel colour, fairly large, not full, but soft expression and showing little, if any, haw. : Thick, fairly large and lobular, set moderately low, just above eye level. Lying close to skull. : Long, strong and slightly arched, not carrying head much above level of back. Slight throatiness, but well marked frill. : Whole body strong and level with no sign of waistiness from withers to hips. : Well developed and muscular in both width and depth. : Deep and well developed; not too round and wide. The back ribs must be deep. : Previously customarily docked to 13-18 cms. Docked: Set low and never carried above level of back. Tail thickly covered with hair but not feathered. Undocked: Set low, of medium length, and not carried above the level of the back. It should taper gradually to a point and be moderately feathered. Lively tail action is typical of the breed. : Legs rather short and strong. Well boned and muscular. : Short and well boned. : Round, well padded, well feathered between toes. : Legs short and strong with good bone. Hindlegs not appearing shorter than forelegs or over angulated. : Strongly boned and muscular. : Hocks large and strong. : True fore and aft with distinctive roll. : Abundant and flat with no tendency to curl and with ample undercoat for weather resistance. Ears covered with soft, wavy hair, but not too profuse. Forequarters and hindquarters moderately well feathered. : Rich golden liver and hair shading to golden at tip; gold is predominating. Dark liver or puce undesirable. : 38 - 41 cms.